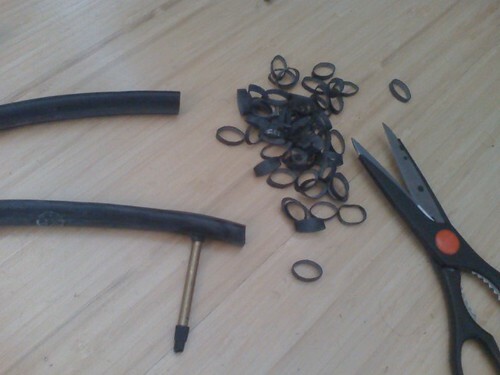 What to do with old bike tubes? In about 10 minutes I’d sliced up the entire tube and now have a jar full of I have no idea how many cool as hell black rubber bands that I can use for any number of things. I already replaced the binder clip I was using to hold a stack of credit cards together in my pocket with one and love it. This was super simple, endlessly useful, and will keep this stuff out of the landfill for a little while longer anyway. Works for me! Help me ID this bike?